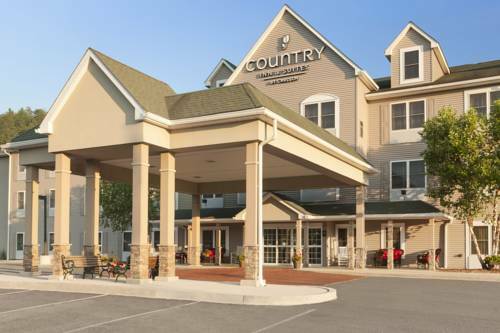 The Country Inn and Suites, Lehighton PA, offers a charming, warm and comfortable atmosphere with friendly staff. This 100% Non-Smoking newly renovated hotel is situated just off Interstate 476 at Exit 74 and only 8 miles from the beautiful historic town of Jim Thorpe, PA. Standard Rooms, One Bedroom Suites and Whirlpool Suites await you. Meeting space is also available with seating up to 40 people which includes a coffee station and free W-Fi. Catering is offered but will need to be set up with the staff at the front desk in advance. All rooms include premium bedding with down comforters with conveniences like microwave, refrigerators, coffee pots, iron and ironing boards and hair dryers. Cribs or cots are available with arrangements made with the front desk, additional charges may be applied. When you visit Country Inn and Suites you can enjoy a hot/cold buffet breakfast served on china followed by relaxing at the indoor heated pool/whirlpool or work out in the fitness center. Make a right out of parking lot, go under Turnpike overpass, make a left. Restaurant will be about 200 yards on right. Turnpike Overpass make lft. Marzen Hardware turn around. Go to Rt.209S 209-443W, across bridge. Parking lot on right. Turnpike Overpass, make left. Turn around at Marzen Hardware. Go to Rt 209-443w. Restaurant on left. Right out of lot and continue north on Rt 209 for 4.5 mls. Restaurant is on left. 23 trails with superb downhill skiing. White Water Rafting and tubing and Kayaking. Class 3 Rapids. The Olympic champion buried in Jim Thorpe never lived there, but the town thought his bones would make a good tourist attraction. They were right! Every so often some Thorpe descendants try to take his remains back to Oklahoma, thus far unsuccessfully.